The Gilis or Gili Islands has been popular for its spectacular white sandy beaches, sparkling blue water, beautiful coral reefs and thousands of species of marine life. This package gives you options to choose various accommodations to meet your requirements and budget, includes return direct fast boat from Bali, 2 nights stay at the hotels/villas on Gili islands, daily breakfast, tax & service charges. Check out from hotel, transfer by Fast boat to Padang Bai in Bali, transfer by shared shuttle service to your hotel in Bali. End of program. > All daily breakfast, tax and service charges. > Shared shuttle (pick up & drop off service) from your hotel to embarkation point in Bali. * Booking should be made minimum 3 days prior to arrival. 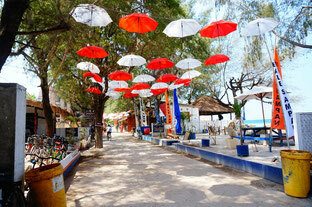 ALAM GILI expand the family tradition of hospitality on Gili Trawangan. This clean and cozy rooms have the facility of hot and cold water showers, mosquito nets and ceiling fan. Located on the quiet northern shore of Trawangan. Aaliku is superbly located, just metres away from the harbor and not far from the central strip where the dive shops and restaurants can be found. Situated a little behind the beachfront. Enjoy peace and quiet at Aaliku. This beautiful resort brings together an enticing blend of spacious cottages, excellent standard of dining outlets, bar, spa, and ocean recreational facilities. A newly opened resort on Gili Trawangan: nestled in a unique atmosphere. Distinguished by style and design: 16 large rooms (from 58 sq. mt.) opening out on to a magnificent 80 sq.mt pool, spa facilities and a hotel operated beach.